New Delhi: The hazardous air quality in Delhi-NCR has prodded top private schools to install air purification systems on their premises. 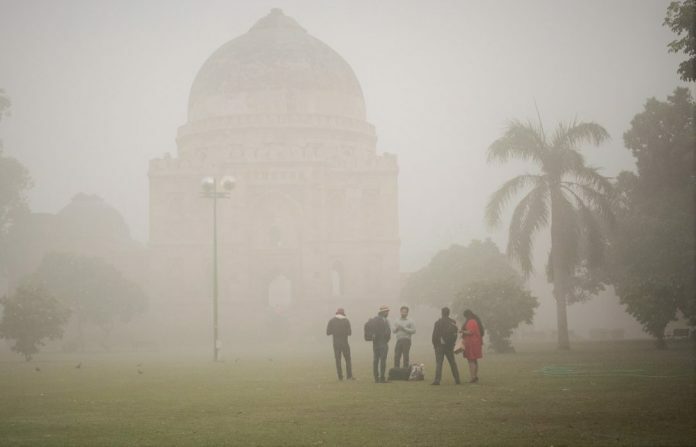 Last November, the national capital was covered by a thick blanket of smog. A reading of the US Embassy’s Air Quality Index Monitor showed 999 on 7 and 8 November — the highest machines are able to read. More than 5,000 schools were closed following a government order, and a public health emergency was declared. With the air quality continuing to be dismal, many elite schools have started laying protective layers in their institutions. From centrally installed ventilation to individual portable air purifiers, these schools claim their classrooms now offer the “cleanest air in town”. The school claims to have built a 1 km-long underground tunnel at a depth of 7-10 metres. “We take the underground air and pump it into our central heating, ventilation, and air conditioning (HVAC) system,” Sukhbir Singh Pundir, DGM, administration, of Pathways, Noida, told ThePrint. “We have also put high efficiency particulate air (HEPA) filters on the inlets,” he added. According to Pundir, Pathways has also taken the initiative to plant 10 NASA recommended saplings on each floor of the premises to remove toxic elements from air. He said some parents are concerned about sending their children to school on peak-pollution days and that they often stop by with their own testing devices to check the air quality in the school compound. “These days you have modular devices that are easy to carry and can test three parameters — PM 2.5, PM 10, and the index. So they check the air physically, and feel happy when they find that it’s under control,” Pundir said. The school administration has provided portable air purifiers to each classroom. The decision was made by the board of trustees after Delhi witnessed a severe spike in air pollution levels in 2016. Gurmeet Kaur, head, operations and administration, says that although there was no pressure from the parents, the school felt it necessary to bear the extra cost and install air purifiers. “However, the fee was not increased to provide the air purifiers,” she claimed. Like Pathways, Shiv Nadar has also increased the density of greenery on the campus. “We have plants which generate oxygen,” Kaur said. Shiv Nadar is in the process of planting creepers along the corridors, and has restricted outdoor activities for children on high pollution days. Shri Ram School was forced to cancel its ‘Annual Sports Day’ in November last year due to extremely high pollution level. After protests from the students, the event was rescheduled for 21 January. Gayatri Unnikrishnan, a Class XI student, said that during last year’s health emergency, a group of parents got together and decided to collectively pay for the air purifiers. “There’s one in every classroom. But people rarely switch it on, so it’s mostly useless,” she said. The school delayed its timings to skip the early-morning pollution density. They have installed two air purifiers in each class. In October and November last year, they discontinued all outdoor activities. “When we had our physical education classes, we were taken to the auditorium, and made to do yoga instead,” said Kyra Bhalla, a student. Since Vasant Valley busses are not air conditioned, long-distance commutes expose students to air pollution in transit. She said that parents are involved in decision making process, and that their recommendations are taken seriously. The school’s daily schedule depends on the air quality reading of the day. Ishaan Rajkotia, a Class XII student, said there are announcements on the PA system every morning, telling the students whether it is a yellow, amber, or red day — a colour-coded pollution warning system. “If it’s anything above yellow, all outdoor sports are cancelled,” he said. Two-three years ago, the school augmented its infrastructure with a new building that houses a centrally-installed air purification system. Since corridors are still outside, the British School also made sure all students were equipped with face masks during the severe pollution days. The schools had to tweak its annual calendar due to the unpredictability of the weather. “It got really annoying because after a certain point training for the football team was permanently cancelled,” Rajkotia recalled. Their Sports Day was also changed from the winter of last year to March 2018. As an asthma patient, Rajkotia talks about how it was “really horrible” being outdoors in the smog. The school has set a certain AQI threshold, after which red flags are placed on the campus, and outdoor activities are suspended. The school installed a centralised air purification system in 2013, and recorded up to 90 per cent improvement in particulate matter on certain days. The air that enters the school building is first pumped through what they call the fresh air purification system (FAS). The school also uses their multiple indoor spaces for physical education classes during ‘red flag’ days. With an expansive indoor gymnasium, fitness centre, and multipurpose hall, the students don’t miss out on physical exercise.